Booking photo via the Charlotte County, FL Sheriff’s Department. 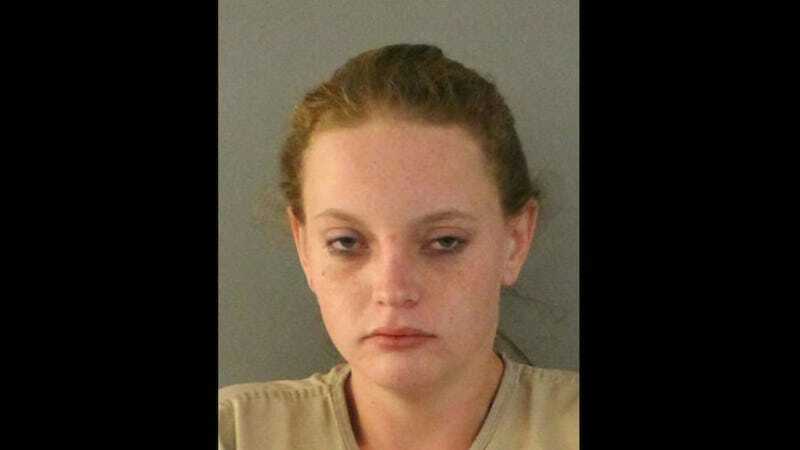 A wedding in Punta Gorda, Florida unraveled into chaos when maid of honor Amanda Willis, 23, “drank almost a whole entire bottle of Fireball” within the first hour of the reception and turned drunk and violent. “She was drunk within 20 minutes to a half an hour,” bride Jennifer Butler told local NBC affiliate, NBC2. According to guests, Willis then began demanding people give her their car keys before eventually stealing the keys from best man Brian Butler, brother to the groom, David. “She just went up to the best man and grabbed his keys out of his pocket and jumped in his car,” said wedding guest Robert Templeton. As she attempted to back out of the parking lot, Butler grabbed onto the car and was reportedly dragged for a few feet before managing to get in the car and pull the emergency brake. Soon after, she became violent, punching Templeton in the face. The guest says he swung back before realizing what was happening and police were called to the scene, where Willis claimed she was having an asthma attack and began shaking like she was having a seizure. Willis was taken to the hospital where she assaulted paramedics, kicked over a bed pan, and exposed herself to deputies. She was arrested and currently faces charges of of larceny, battery, grand theft of a motor vehicle, and violation of probation. This is her 9th arrest in Charlotte County and the bride says that they are no longer friends.